Manufactured with 1 inch aluminum tubing, this white bath stool by Drive Medical is lightweight yet does not skimp on stability. At 3.5 lbs. this white bath stool is portable and great for travel. Additional leg support collars provide increased strength and support. Impact-resistant, composite seat is both crack-proof and tarnish resistant. The bath stool's attractive white finish is sure to match any bathroom style. The product is protected by a limited lifetime warranty. - Impact resistant, composite seat. 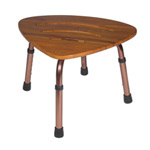 - Height adjustable legs are crack-proof and tarnish resistant. - Support collar reduces rattle.